We couldn't be more excited to release the latest addition to our Classic Series: The Eastman. The Eastman is nothing short of spectacular for homeowners looking to build the home they've always dreamed of. This home features an exterior which brings the outside in, in the most outstanding way. The beautiful design has an oversized front porch which extends to entrances from almost all rooms in the house - the dining room, living area and master bedroom. A full size, stone, indoor/outdoor fireplace in the middle completes the ultimate outdoor living space. The Eastman stays true to the classic design with floor-to-ceiling windows, maximizing any view, and promoting health and wellness with an abundance of natural light. 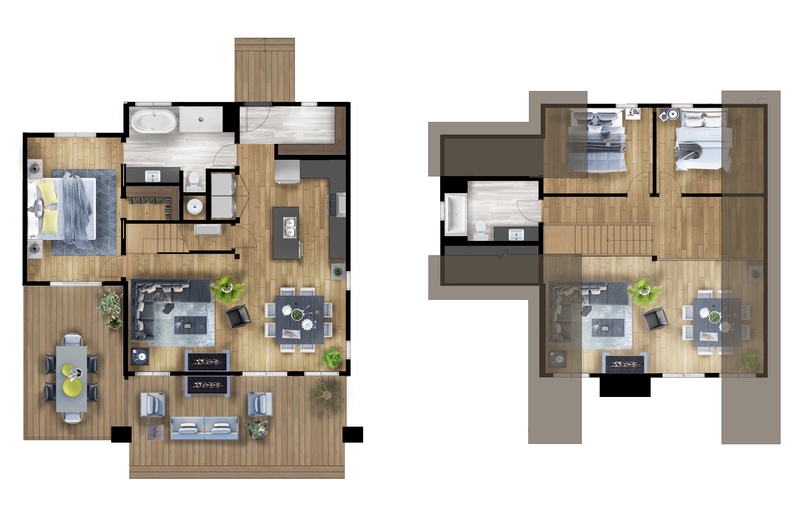 The interior of this unique plan promotes family togetherness with wide open living spaces, from the dining and living areas, through to the kitchen. The master bedroom is on the main floor, and includes a walk in closet and oversized, plush master bath. Homeowners are treated to a convenient main floor laundry area, followed by a mudroom leading to the back entrance. Upstairs, you'll find 2 more bedrooms and another substantial, full bath. The Eastman is not only eye-catching on the outside, but is one of the most welcoming homes in our Classic Collection. Dining Room: 12'-7" X 13'-0"
Living Room: 12'-8 X 13'-7"
Bedroom 1: 10'-11" X 16'-9"
Bedroom 2: 12'-6" X 9'-11"
Bedroom 3: 12'-6" X 9'-11"
While the Eastman is officially a part of Timber Block's Classic Series, the history of this home design is unique with an interesting background. The Eastman was designed for a Reality TV show, which aired this past fall. Tous Pour un Chalet featured 9 teams of 2 people who had to work together to build the Timber Block home from start to finish, including the interior. Each episode featured different challenges for the teams, with periodic eliminations until 1 team remained. 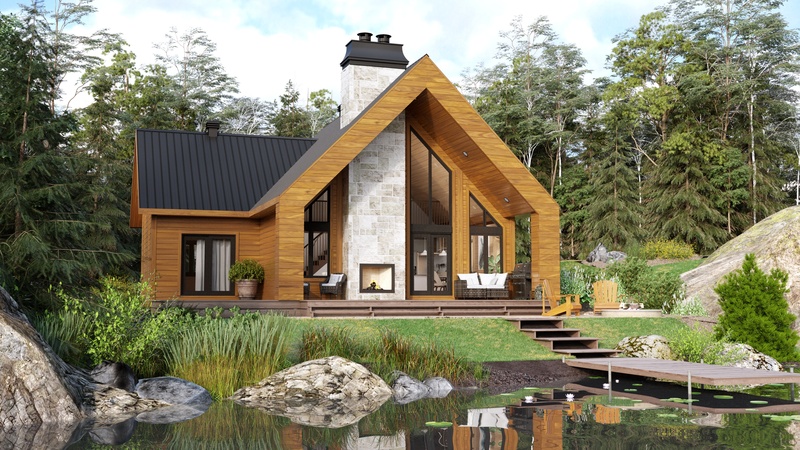 The final team WON the Timber Block home, located in Quebec. Timber Block is proud to add the Eastman to the Classic Collection, which is home to several models, from a few hundred square feet to a few thousand square feet. Three other series are available as well, including the Craftsman, Vintage and Contemporary. These models and floor plans can be built straight from the stock plan, or modified to the homeowner's satisfaction. Timber Block has grown to be recognized as one of the top manufacturers of panelized, engineered wood homes in the world. Our advanced technology and commitment to sustainability has garnered several awards, in a variety of categories, including the NAHB 2017 Global Innovation Award. Timber Block is a proud partner of Mike Holmes, and is Holmes Approved. Learn more about Timber Block's patented, green technology, visit www.timberblock.com.